welcome to the magical world of Albion Online. In this guide we have collected various useful links, guides and tips to make your Albion Online launch-week more enjoyable. This blog post is directed both at new and experienced players alike and will develop over time as more resources are added by the community. If you think we are missed any useful resource, please let us know on the forums or on Discord and we will gladly add your resource to the list! We begin with a list of official websites and social media accounts where most of the official announcements and news will be listed and re-posted. Some more in-depth content such as testserver patch notes or a dev-tracker show up on various other places and will be listed seperately. The famous killboard, where you can look up recent kills, battles, gvgs and other good pvp stats. The character builder & guides websites are in early production, but have a few good ones. You can even upvote your favorite ones. In addition to that we recommend the testserver forum for testserver patchnote threads and the official patchnote websites visible in the launcher and the website. If you are still looking for a guild, make sure to keep an eye on the guild recruitment forum section of the official forums. If you have a beginner question, there is a beginner question’s forum for you. Maybe your question was already answered? 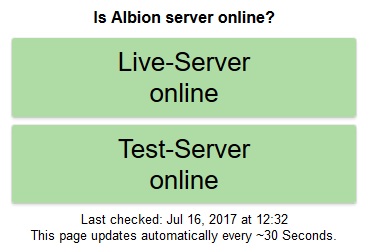 Lets start with is.my-albion.online, it is a super quickly coded tiny website that checks if the albion servers are online, similar to our launcher. But some of you might not have your launcher on other devices. If you are looking for beginner guides for yourself or to link to your friends, we recomment the guides by Scythian on the official guides section. He wrote guides for the tutorial starting quest, the follow up quest and how to get your free T2 starting mount, how to go about unlocking all T3 weapons, armor & crafting and how to tackle the first expeditions on T3. Ver collected a lot of useful links in his awesome spreadsheet. I might as well admit that I stole some of the links posted here from him in the first place ;). But a big shoutout to Ver! On his spreadsheet you can find among many other links..
Elsa, one of the Super Moderators of the forum made a very handy Item Skills & Stats Spreadsheet where you can find an overview and detailed stats about all the skills of the game, presented in a nice and easily readable format. It also has tables about stats of armors, mounts, accessories and other neat stuff for you stat fanatics out there. ChronoChimera‘s cheat sheet updated last for Hector has a lot of useful ingame information. Timer reset times, respawn timers of various chests, loot tables, drop chances for mount babys, puppys & fawns, fame modifiers for zones, premium bonus details, group fame modifiers, a list of chat & emote commands, the item power softcap table, expedition mob details, the black market forumla, island upgrade costs and other info. Once you got into the game a bit and are looking for more details, its highly recommendet! I have to say I hate Albion Offline with a passion, because the only thing they to is automate and repost official content without anything interesting added to that for what I assume is ad revenue. But they have to my knowledge the only working dev-tracker for Albion Online currently. AlbionOnline2D (AO2D) is a database tools website that is under development, but already has a lot of promissing features. In addition to a working item and spells database it features an albion map for your browser that reminds me of eve’s dotlan. It’s not perfect yet, but worth bookmarking for sure. 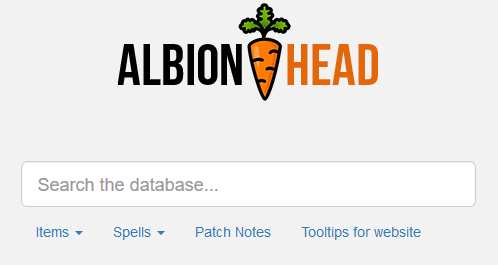 AlbionHead.com is a items, spells and patchnotes website that has a sleek look and a promissing item and spells database. The Albion Trade Federation Discord is an out-of-game discord trade chat to post WTB / WTS / WTT offers and chat with fellow merchants and traders. Disclaimer: This is my side-project. The player HaH Reported periodically updates his Guild Registry thread, which is worth checking out as well, if you want an overview about guilds or are looking for a new one. A very useful spreadsheet is the ‘Startup Costs‘ spreadsheet, that has some simulations on tax income for guilds, but also building costs (silver & resources detailed in very helpful tables. Check it out for sure. Albion Informer is a weekly podcast and news blog by Shozen and Bogul featuring official and community news, discussion about game updates, spotlights of community events and interviews with famous and infamous community members. If you have other links for me, please PM me and i’ll add them! That was that! 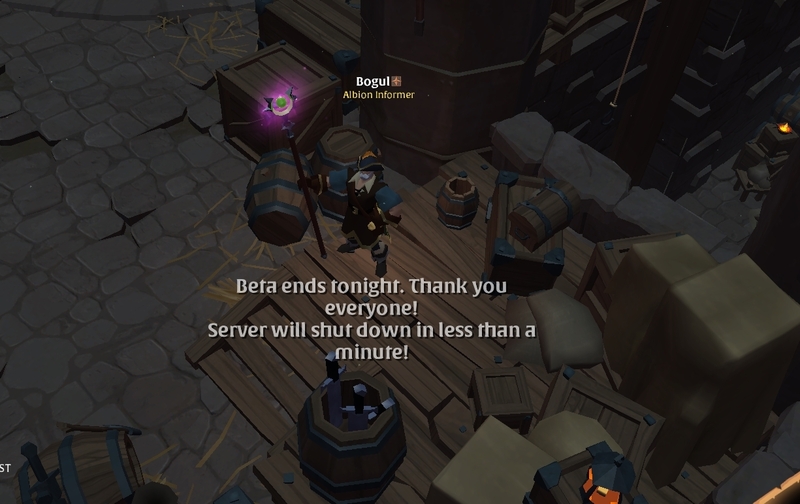 Final beta just ended guys! Testserver will be up during this week and next week we finally launch! With final beta coming to an end this weekend, we see a bunch of events to celebrate those last days of final beta. Part of the end of beta celebration week is a 5vs5 Invitational Tournament that will be the content of todays blog-post. 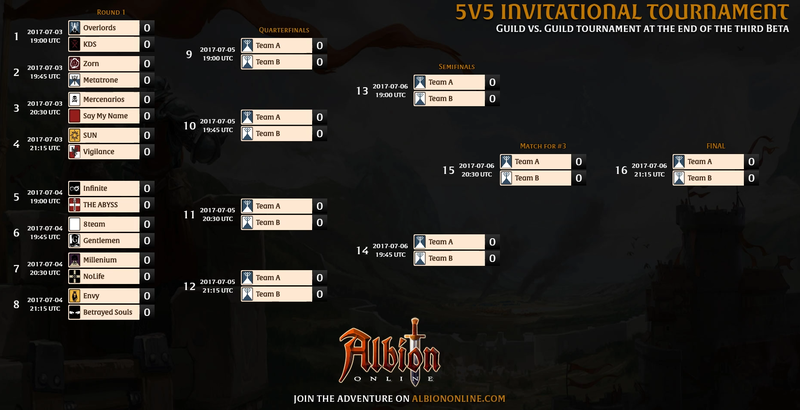 To celebrate the end of final some of the best GvG teams were invited by Evoque and the caster team of AlbionTV to fight it out in a last and glorious beta tournament. 16 guilds were invited to participate in the multi-day international tournament for pride and honor. The initial matches were BO3, while the finals were BO5. Participants had to bring their own gear, but they only got knocked down – so no gear loss had to be expected. A gear cap also existed that was set at the equivalent of T7.0. At the end of this post you can also find links to the twitch.tv VODs of each tournament day and a nice youtube cut if you only want to see the fights. Comment: Some of the fights are really good and I recommend to watch at least the fights from the later rounds of the tournament, as they are shorter than 5minutes each. One of my personal highlights was a splash screen that gave us yet another name for what we used to call final beta. From now on we will refer to it as “third beta“. Heh. For the keen reader of our blog and listeners of our podcast, you might have noticed that Red Army – one of the most successful teams this beta declined to join the tournament. As far as we understand they had scheduling issues so they could not participate this time. We saw a lot of good fights however and I hope this tournament may turn into a regular thing. Check out the links to the vods & videos below. For those of you who do not want to watch the full stream, there is a nice post on the official forums by Deathbec0mes where he cut out everything except for the fights and put it on youtube. As promised a little writeup on the french community event that broke all records for kill fame last week! Comment: Shoutout to the french community for organizing such a massive event that results in impressive numbers! There seems to be some tiny drama involved as well. Lol at suicinding into the raid boss to get a guild cape Ad Honores? a 96.000 gold prize pool total! Now this is the tricky part that may have partly gotten lost in translation. We could only get a few comments on the event so far. If you have corrections, additions or information, please send them here: AOinformer@gmail.com. According to our source Ad Honores pulled some kind of stunt by ‘suiciding’ into the raid boss to get the guild cape. Lol! But technically Vigilance and Indy Veni Veci won both the PvE and PvP categories and the sweet gold moneys.